MEDIUM 16.4 x 21 in. (417 x 535 mm) 19 x 24 in. LARGE 21 x 26.95 in. (533 x 685 mm) 24 x 30.5 in. This great masterpiece of the goddess Vasundhara was painted over a period of three years by the famous Newar artist Siddhimuni Shakya (1933-2001), and his son, Surendra Man Shakya (born 1967). Siddhimuni chose to devote the last ten years of his long painting career to the creation of three paintings, within which he could embody the full iconographic spectrum of his unique artistic vision. These three paintings are the most important Newar works of the last century, and I was able to acquire two of these paintings, Vasundhara and Chintamani Lokeshvara, shortly after Siddhimuni's death in 2001. 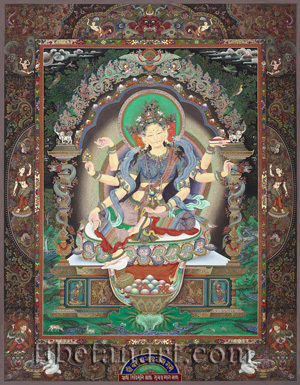 The third painting was of Manjushri and his two consorts, which was bought by a collector from Japan. The mineral pigments used in these paintings were given to Siddhimuni's father, Anandamuni Sakya (1903-44), by the Thirteenth Dalai Lama of Tibet, and the actual size of this painting is 27" x 21" (68.5 x 53.5 cm). Three metal pigments - yellow-gold, red-gold and silver - are extensively applied throughout each area of the painting, and the cotton cloth used for the ground was woven by a sixteen-year-old Newar girl (kumari) from the Shakya caste. The countless little details and ornaments contained in these paintings are so intricate and exquisitely painted that they can only be fully appreciated with the aid of a magnifying glass. The long and comprehensive text that accompanies this Giclee print describes virtually all of these details. Vasundhara, the 'treasure-holder', is a Buddhist goddess of wealth, fertility, abundant harvests, and a consort of the wealth-god Jambhala, and like Lakshmi she is one of the most popular goddesses in the Newar pantheon. She is golden-yellow in complexion, with three faces and six arms, and she sits in a posture of royal-ease upon a white moon disc and multicoloured lotus, with her right foot resting upon a white conch-shell and a golden treasure vase. This treasure vase has a pouring spout, and it rests upon an ornate jewel-filled golden bowl, which in turn rests upon a large undulating lotus leaf. Each central petal of Vasundhara's lotus seat enshrines a small image of one of the thirty-two Buddhist offering goddesses, and her exquisite throne is adorned with a magnificent arch or torana, which is ornamented with a multitude of mythical creatures, emblems and symbolic designs. Vasundhara is radiant, youthful and beautiful, with three sweetly smiling faces that are coloured red (right), yellow (centre), and red (left). She is crowned by the small image of white Vairocana Buddha and adorned with all manner of embroidered silk garments and precious ornaments - many of which are depicted in the simulacra forms of colourful birds and mythical creatures. With her lower right hand she makes the boon-granting varada-mudra, with her second right hand she holds a blazing 'triple-gem' emblem, and with her upper right hand a sapphire rosary. With her first left hand she holds a jewel-topped nectar flask at the level of her hip, with her second left hand she holds three stalks or 'ears of rice', and with her upper left hand she holds a sacred text. The two inner borders of the painting's rectangular torana are decorated with intricate scrolling patterns and colourful brocade designs, while the broad outer torana is decorated with a stylized floral frieze that encloses various symbolic elements. Within the central arc that crowns the torana is the serpent-devouring head of kirtimukha, which is flanked by the forms of two naga-serpents. In each of the upper corners are a ferocious makara, and a coiling dragon with a human figure upon its back. In the arcs on each side of the torana is an offering goddess. In each of the lower corners is a lotus-mounted wealth-god, who pours a stream of jewels from his sack into a bowl. Beside this bowl kneels an avaricious and hairy khyak spirit, who greedily fills his own sack with these jewels. The Newar motif of a wealth-god pouring jewels, and a khyak spirit gathering them, are commonly represented as the main attendants of the wealth-goddess, Lakshmi. At the bottom centre of the torana is an inscribed dome-shaped emblem, which is flanked by two dragons that coil around pillars. The lower red horizontal plaque is inscribed with the names of the artists, and the Newar year of the painting's completion, 1999, (Nepal samvat 1119), is inscribed just above. And the curved blue plaque above is inscribed with the deity invocation, Shri Vasundhara Devaiya Nama.